Fans of the series have been eagerly awaiting the sequel to Fantastic Beasts. 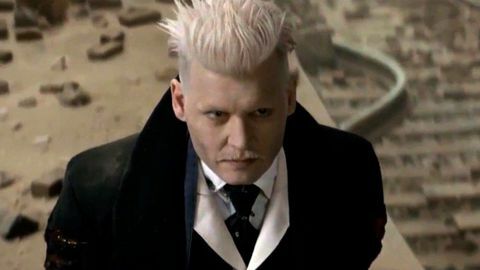 With The Crimes of Grindelwald right around the corner, it will undoubtedly be a hit for Warner Bros.. Although Depp's casting was a bit scandalous due to the reports of his tumultuous relationship with his former wife Amber Heard, the studio stood their ground as some called for the character to be recast. And after a dramatic appearance at San Diego Comic Con, WB was steadfast but hid him or kept him buried beneath the massive marketing campaign for the film. Now, it looks like the character and Depp are going nowhere. "I loved it yeah. I loved it because that's really an arena where you can fly around and try different things and approach a character with a lot more…um…to take someone who is teetering on being a fascist, yeah he's a fascist, he's one of those, but to play him as a sensitive, concerned yet manipulative and powerful wizard. The possibilities in that world are wide open, so you can really try anything. So it was a gas and I look forward to the next installment, which I think we start the middle of next year." Although Depp has seen his star dim a bit in the past few years, it would be great to see him come out of this on top with his reputation as a great actor in tact.